The twitterverse is a wondrous place. It has introduced me to dozens of lovely characters (in 140 characters or less) one of whom is Andre Dang (@andredang) a rather splendid person whom I have only met in real life the once, but feel as though I know rather well. But it was still a lovely surprise when he made good on a passing tweet and sent me some of his prototype pickles. 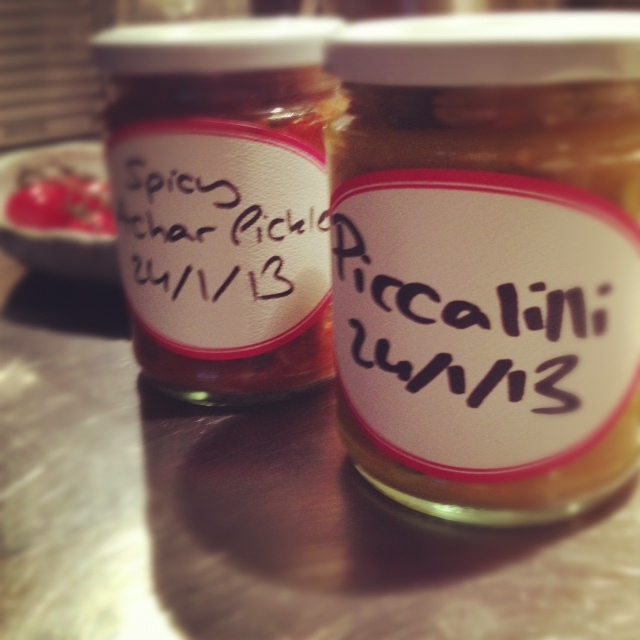 A piccalilli and an achar. 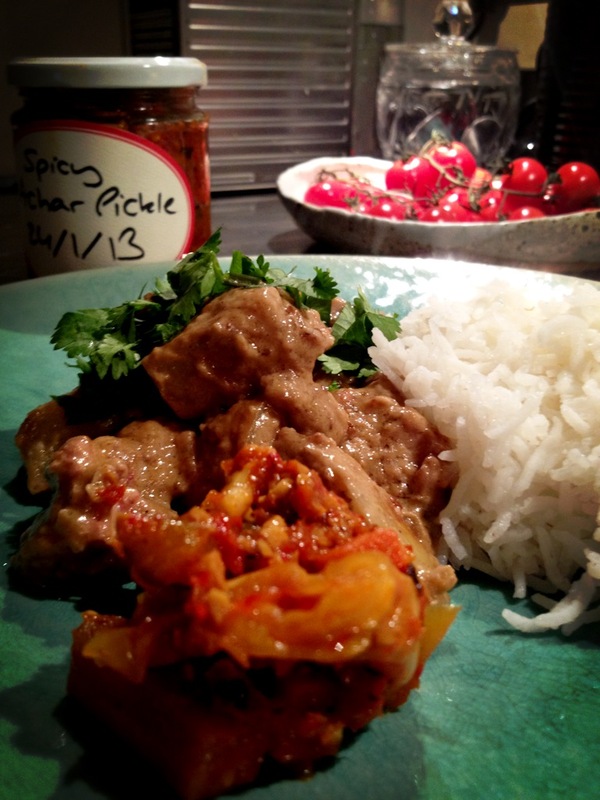 Now, I like piccalilli but I love achar. It’s a fresh pickle made from crunchy vegetables and chill used as a condiment across South East Asia, a part of the world of which I am unduly fond. More of this later. I had planned to make a simple stir fry with some of the duck from the Waitrose Valentine’s Day Meal Deal (as featured in my previous blog posting). But the achar was so sharp it deserved something very rich to cut. So I settled on a Malaysian curry – Massaman or Muslim Curry is often made with beef, but I used the boneless stuffed duck joint from the meal deal. (I’m beginning to loathe that phrase). I’d already cooked it yesterday as it had hit the sell by date – just roasted in the oven, cooled it and put it in the fridge. Today, I split it open and set aside the pork and orange stuffing and a little less than half the duck for another recipe (to follow shortly). The rest, I sliced thickly in preparation for this recipe. You could buy a massaman curry paste. There are some good ones but I made mine…or a version of one. I’d run out of peanuts so used macadamias. Not at all traditional, but who cares. By the way, this recipe has made enough for at least two or even three servings. Which means that so far, I’ve already made 5 – yes count ’em – 5 suppers from one meal deal and still got a long way to go! You won’t need all this paste but it freezes well or you can keep it in a jar in the fridge for a couple of weeks. Stir in the coconut milk, tamarind, fish sauce and sugar and allow to bubble for a few minutes. Throw in the potato and simmer vigorously. Don’t be worried if it catches a little. It wants to almost split, reduce and turn a rich caramel colour. This should take about 15 – 20 minutes. If it looks like it’s getting too dry, add a little water and continue to reduce until it coats the potatoes richly. Add the duck and warm through.